Have you ever tried barre? It’s apparently one of the fastest and most effective workouts to change your body. I tried it for the first time about two weeks ago and I quickly realized why it’s so effective! Within the first 15 minutes of class, my arms felt as if they were on fire! I knew it would be a bit of a tough workout, considering I’m not the most fit person around, but I had no idea of the magnitude at which the class would kick my #$@%$!!!!! Throughout the workout my body was shaking like a bowl of JELL-O! Barre is a low-impact, high-intensity workout inspired by dance, Pilates, and yoga. Movements are small, isometric, and intended to tone, lengthen, and strengthen your body while also adding flexibility. Most barre classes follow the same structure—start with a warm-up full of planks and push-ups, then do a series of arm exercises, and continue at the barre (as in ballet barre) for a series of movements for the lower-body (thighs and glutes). From what I understand, it’s best to get in 3-4 barre workouts per week for the best results. With barre you spend an extended period of time in a muscle contraction while performing an isometric hold to intensify the work. Trembling, a sign of muscle fatigue, is a way for your muscles to let you know they feel it. My muscles weren’t shy about telling me what they felt. They pretty much were trembling (yelling at me) throughout the duration of class. As shaking is a good thing, I tried to hold and embrace it! I’ve gone to a few classes now and it’s gotten a bit better. My muscles still feel the burn but they’re a bit “quieter” about letting me know. 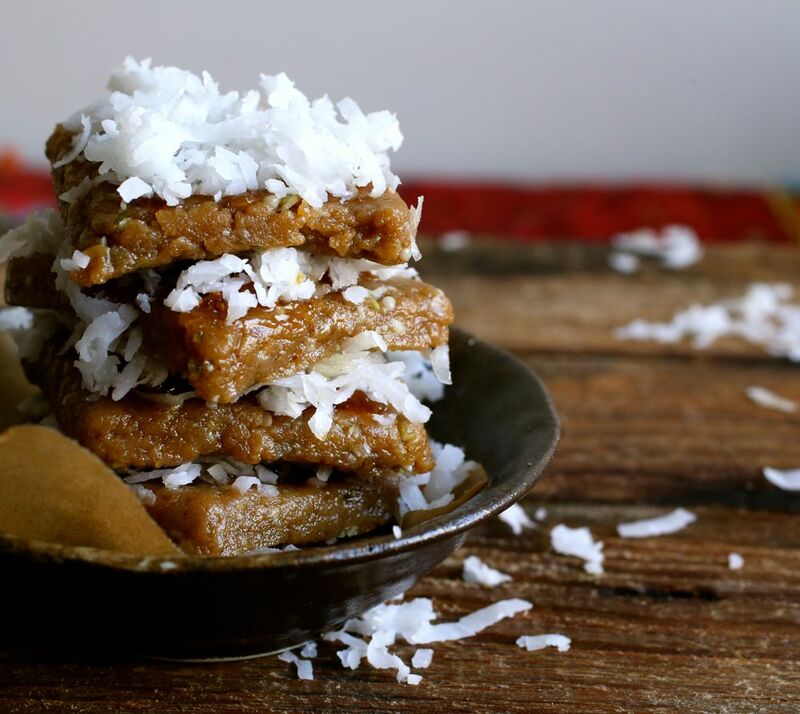 After my first barre workout, I was motivated to come up with these two easy, no-bake, recipes for superfood energy bars to have pre or post my barre workout. Most energy bars are filled with a lot of sugar, almost requiring another workout to burn the calories after you eat them. These, however, are quite different. Small, moist, dense and chewy, they’re vegan, gluten-free, and filled with healthy nuts, seeds, dates and dried fruit. The combination will offer you not only a healthy dose of fiber, carbohydrates and protein for lasting energy, but also heart healthy omega-3 fat, and a boost of antioxidants, vitamins and minerals. 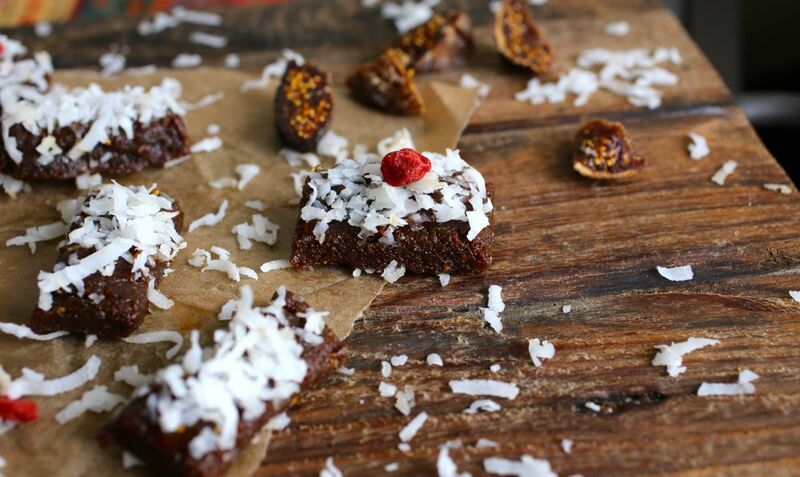 As dried fruit offers usable energy plus vitamins and minerals, in one recipe I use dried figs which are rich in potassium, making them an especially great option for after exercise. This is because potassium, which is responsible for regulating body water and ensuring proper muscle contraction, needs to be replenished after having been depleted in a workout. 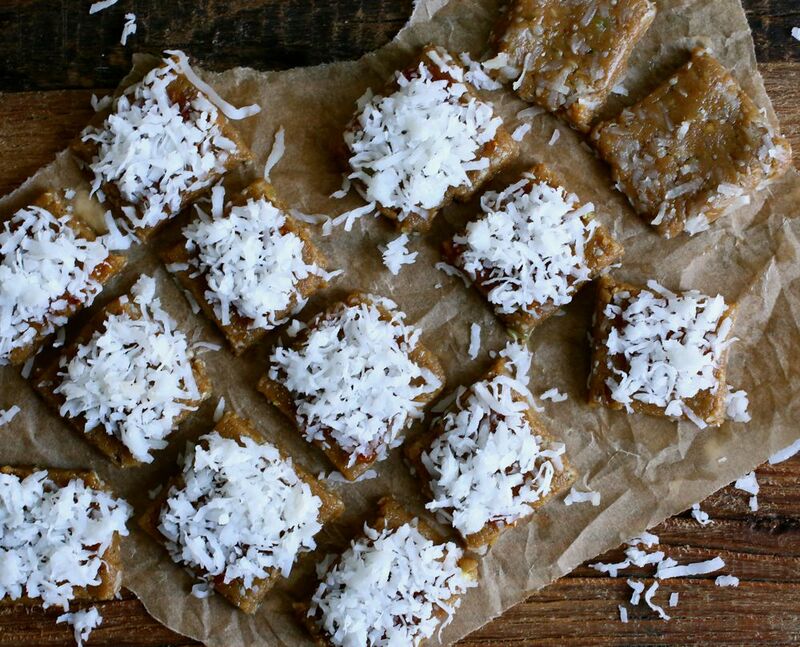 Making energy bars at home is actually quite simple. The bar basics? Use equal parts dried fruits, nuts, and pitted dates. Combine them in a food processor until they turn into a thick paste, press into a large square or rectangle, chill, and cut into squares. 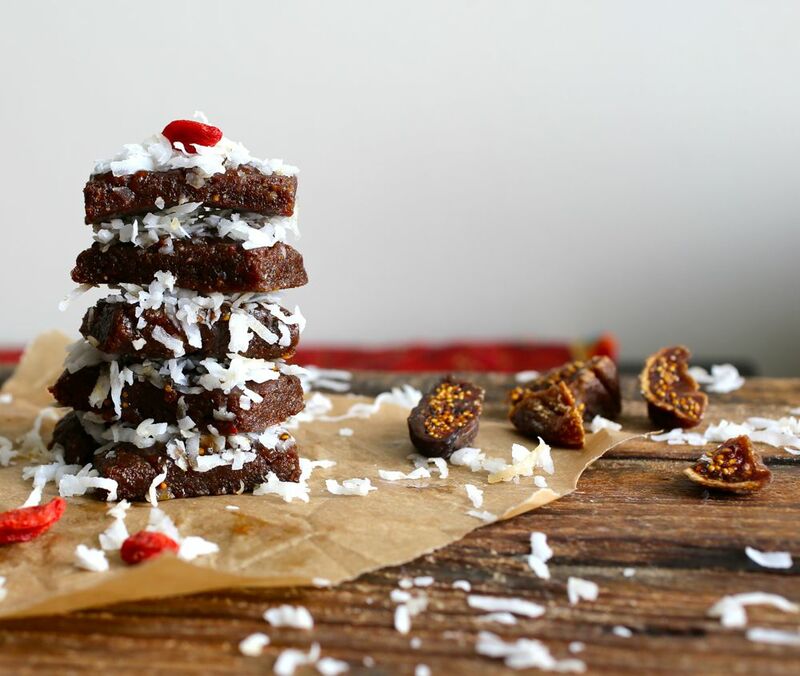 You can tinker with the basic recipe, adding other ingredients into the mix: chia seeds, flax seeds, pumpkin seeds, coconut, chocolate chips, cacao (raw chocolate), super foods like goji berries and/or maca powder, and more. Add the extras a bit at a time until you get the right taste and texture to suit your preference. I decided to add maca powder and goji berries, relatively new superfood ingredients in my pantry. Maca root has been used by indigenous Andean societies for thousands of years. It helps increase energy and combat fatigue. 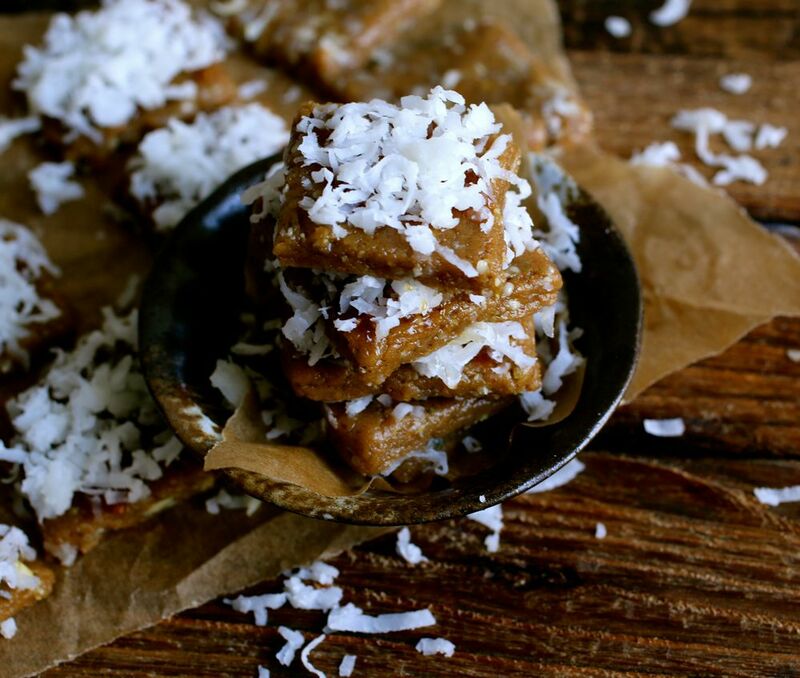 Nutrient dense, maca is packed with vitamins, minerals and amino acids. Goji berry is one of the most nutrient-rich foods on earth. It’s a vegetarian form of protein, packed with essential amino acids and rich in beta-carotene (Vitamin A). You can add maca and/or goji berries to oatmeal, smoothies, granola, yogurt, energy bars, and many other recipes. Feel free to make the bars as is, or add your own twist to them! The possibilities for variations are endless! So there you have the bar(re) basics. Have you tried a barre workout already? 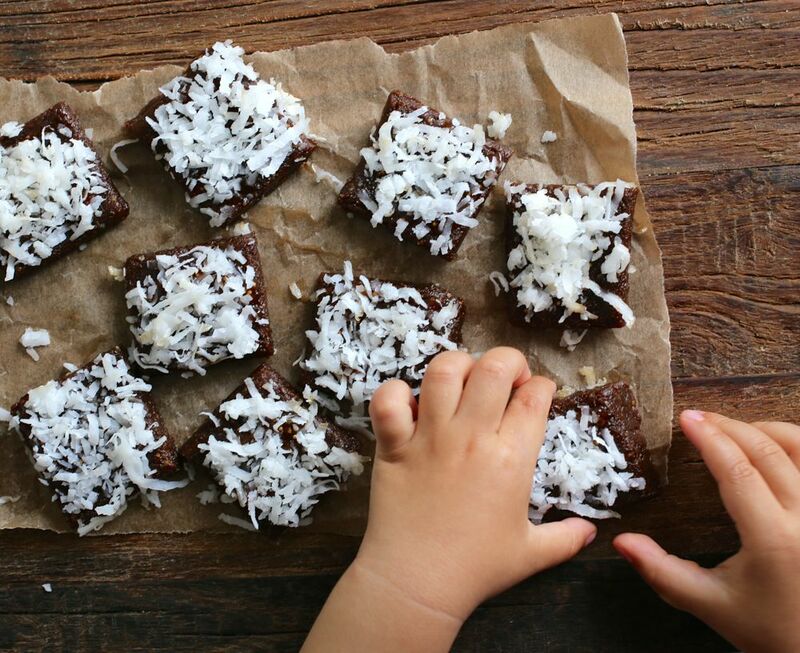 If not, try it out and don’t forget to pack one of these superfood energy bars along with you! In a food processor, blend nuts and sunflower seeds until creamy, about 3-5 minutes. Add dates, 1 teaspoon oil, maca, and extract (if using), and pulse into well-combined, about 1-2 minutes. If mixture does not come together, try adding a little more coconut oil or a mother date or two. Turn out the mixture onto a sheet of parchment paper. Press into into a ¼-inch thick rectangle. Cut into 1-2 inch squares. Store in the refrigerator. If using spread or jam, add a small smear onto each bar. Add shredded coconut to a small plate. Press both sides of the squares into the coconut to coat. Refrigerate for about an hour prior to serving. In your food processor combine dates, figs, and nuts. Add the rest of the ingredients, except for the fig spread and coconut flakes. Turn out the mixture onto a sheet of parchment paper. Press into into a ¼-inch thick rectangle. Cut into 1-2 inch squares. Store in the refrigerator. Notes: The energy bar dough can also be shaped into small balls. Refrigerate until firm, then wrap in plastic for longer storage. Besides those listed above, a few other possibilities for add-ins include chocolate chips, cacao nibs, crystalized ginger, ground cinnamon, ground nutmeg, ground cardamom, orange zest, lemon zest, lime zest and a variety of extracts. Have fun trying new combinations! Wow. Never heard of Barre before. I’m a fitness freak myself so must try it out! just discovered the barre workout! did a routine at home, i feel awesome!!! Good for you! Isn’t it great?! I love it! Such a fan of the ingredients here, especially those figs. If you go to the official Barre site, you can buy a home video that’s awesome. Our new house in Carmel has a licensed Barre studio literally around the corner. So popular with my friends. They even have childcare! Hope you guys are well! Lovely post. Hi Shanna, thanks for the information on the home video! A great option for those who can’t make it to a studio. Carmel! How nice!!! I drove through Carmel many many years ago. I still remember all the art galleries and quaint boutiques. Lovely town! I hope you enjoy your stay there. Thank you! Keep up the great blogging! This sounds great. I’ve never tried barre but i really love working out. You have such great nutrition facts here. I may just have to make these! Good job with giving it a shot! Thanks Amanda, I hope you do make them and love them! Glad you liked this post. Thank you! Hi Fae, energy bars made of lamb! Ha, now that would be interesting…. 🙂 As for the barre (exercise) classes, I understand home videos are also available. I know the struggle and need to get in shape. I’m working on it myself. I just posted on an upcoming Spring Cleanse/detox. It might help kick start your fitness routine! Yes, very intense, but feels great to know you’re working your body so hard! My muscles still tremble in class! I hope you get to try barre sometime. THANK YOU!! for these bars, Martine! Even more because no baking is involved! You’re right about the sugar in most energy bars–also most contain soy which is horrible for me. You’ve given me a tasty and healthy alternative. Great!!!! So glad these might work for you! Please let me know what you think if you try them!